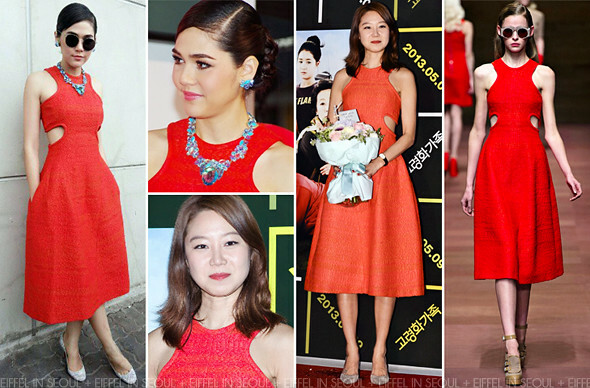 Thai actress, Chompoo Araya A. Hargate (อารยา อัลเบอร์ต้า ฮาร์เก็ต) was first seen wearing a gorgeous red woven raffia cut-out dress from Carven Spring/Summer 2013 collection to Racer promotional event held in Bangkok, Thailand on March 15, 2013. The beautiful actress accessorized her look with turquoise jewels and a pair of silver glitter pumps. South Korean actress, Gong Hyo Jin (공효진) was seen wearing the same dress to the VIP premiere of 'Aging Family (고령화가족)' held in Seoul, South Korea on May 6, 2013. The fan of Carven wore a pair of beige suede pumps with the dress.